The Markhat Files series is way too much fun. I couldn’t bring myself to stop and write up each book as I read it, so I’m binge-reviewing these books together (slightly delayed) because I binge-read them, only logical. Note: For additional humor, read all Tuttle’s book dedications at the front of each book and his About the Author at the end of each. While some Author info is the same between books, there are multiple versions, and his dedications are sometimes humorous (they may be all the time, and I’m just missing the joke on some). You’ll be missing some of Tuttle’s quirky humor if you skip them. Markhat is a finder – a private detective of sorts – in Rannit, a city torn by war, poverty, and magic stumbling into the steampunk age, since the steam engine and all the industry it entails does not displace the magic , magical creatures, and spirits that haunt the city. Three Mean Streets includes three short stories, each a separate case. Each story continues the character- and world-building, but stands alone, much like a Sherlock Holmes story. Except Sherlock Holmes didn’t have help from a voodoo-type magic wielding card-reading potion-pouring non-grandmotherly Mama Hogg shaking dead birds around and muttering madly. All three stories are quirky, fun, and engaging. You just like Markhat more and more the further down the road you travel with him. He isn’t afraid to tackle death-dealing enemies, act honorably, or change his views about trolls and other enemies. The endings, villians, and heroes aren’t always what you expect. Mama throws in a punch or two, since making things stay dead isn’t always as simple as it ought to be. Markhat is hired by a set of hulking brothers to find their sister. She’s disappeared from her seamstress job and might be on a countdown to join the other woman who have been slaughtered by crazed cult members. Mama Hog is on hand to lend a little soul-destroying assistance (with Mama Hog to help, who needs enemies? ), as is Evis Prestley (gotta love that name! ), your local halfdead vampire mobster. Markhat must face unholy priests, monsters, more monsters, and become a monster himself without becoming eternally monstrous. Tuttle mixes horror with humor with surprising panache and a fistful of attitude. Another enjoyable foray into Tuttle’s imagination. Markhat has taken to smoking quality cigars with a local halfdead vampire gangster, Evis Prestley, he’s somewhat affected by the huldra’s habitation, but he’s still open to helping a lady in distress. Mama Hog is helping again by supplying an assistant for Markhat, her rather naïve niece. Someone is out to steal Lady Werwilk’s isolated home in the woods outside Rannit. Is it her brother’s keeper, a jealous art gallery owner, or something far more sinister? Add in a banshee, cannons, monsters, and gods and Markhat has his work cut out for him. Luckily, Markhat has Evis and Mama Hog on his side. Because sometimes it’s hard to tell the good from the evil and friends from enemies. Yet another great Markhat story mixing horror, fantasy, humor, and a whole lot of originality. Tamar and Carris are to be wed, blessed, and kiss as the broken bell tolls. Think Romeo and Juliet with blackmail, magic, betrayal, hopefully happier endings, and Darla. Carris Lethway is missing, his mother is distraught, while his father coldly dismisses offers from the kidnappers. With Darla at his side and a bit of help from Mama Hog, a halfdead gangster, and a banshee, Markhat will fend off bakers, murderous military veterans, and do his best to get Carris to the church on time. Another original blend of horror, fantasy, steampunk, and voodoo all rolled up in a mystery. Who knew that Markhat was such a romantic? He’ll protect his own love and put his life on the line to save another’s lover. Markhat may be sorry he didn’t raise his prices even higher when Evis came calling. Markhat is being paid 1000 crowns for a week floating along in a riverboat with Darla. And vampires. And murderers. A mysterious sorceress speaking in his head. And a banshee with a glowing skull of an innocent child for a toy. What could go wrong? Will the Watch ever believe that Markhat just happens to be nearby as the dead body count rises? It’s the usual mysterious mayhem as powerful sorcerers manipulated by even more powerful beings set out to destroy the Regency. Markhat, Darla, Stitches, and friends might have a few objections. Markhat is hot on the trail of a vicious cold-blooded killer when he sidetracked by a blind waif whose dog has been stolen. Hell hath no fury like Markhat, who was a dog handler in the war, and who is a dog lover in a city of veterans who credit dogs for bring them home safe from the war. While dogfighting is strictly illegal and despised in Rannit and perpetrators find themselves beat down quickly, there are foreigners in town. And Markhat’s not about to tolerate a person who’s low enough to steal a destitute blind child’s dog. And he’s really on the warpath to the lowlifes who organize the dog fights. What Markhat doesn’t count on is discovering a conspiracy that has the great Dark Houses running terrified, and a death god running amok. Can Markhat save the city, Darla, and himself? Throw in a god of chance and fate and anything can happen, but Markhat must pay the price. I absolutely love this book, which clinches Markhat’s role as the nicest finder we know with a soft spot for dogs (which we had hints of) and children. While he’s soft enough to arrange for them to be fed now and in the future, he’s mean enough to track down and annihilate the villains who harm them. The Darker Carnival is the darkest Markhat book so far, adding in horrific clowns and other assorted Darker Carnival actors. Yes, the carnival is in town and after dark, it’s a circus of death with the audience as the main attraction. Markhat has been hired by the parents of the Living Dead Girl and he’s bound and determined to free her from the evil that dwells at the heart of the carnival. Markhat is in his element as he takes on an evil sorcery older and deadlier than he could ever imagined. He’s also dealing with Evis and Gertriss problems, but let’s not get into that. Before it’s over, Markhat will have to do his best to free his employer’s daughter, a banshee, and himself from the carnival’s sorcery. Luckily he’s got Mama Hog and her cleaver on his side. Because this prison is holding more than he thought it was. Every time I read a new Markhat book, I think it’s my favorite, and as I re-read them, I think each one is my favorite again! In Way Out West, Markhat and Darla take a train ride on the Orient Express… I mean, the Western Star, traveling thousands of miles from Rannit to Mama Hog’s questionably strangest acquisition: the town of Railsend, here after known as Hogstown, the home of Mrs. Hog’s Home for Orphans and Widows. And that train ride takes almost the entire book, for good reason. There are trolls, who aren’t as bloodthirsty as we might have thought they were, and an excess of sorcerers who are just as evil and bloodthirsty as we thought they were. Markhat gets railroaded into serving as the marshal and discovering just who on the train isn’t who they say they are, who’s really killing whom, and if the dinner services is anywhere near as good as it ought to be. Mama Hog and her ideas may be the death of him yet. Yet another fabulous Markhat book that sadly seems to be the last at this time. Here’s hoping that Markhat breaks free of his treacherous author and finds his way to more mysterious missions. This book brought to you by the letters A through Z, the space bar, and the various components of punctuation. Except the semicolon, because it is evil and the source of all misery. Also, the color mauve wasn’t much help. This novel should not be combined with corn syrup. Honestly, it’s a shame we have to mention that, but after the events of last May (we’re really sorry about your ebook reader, Mr. Dercroft-Higgins) it’s best to state this explicitly. Also, clinical studies show that koi and other members of the carp family may find portions of Chapter Eight disconcerting. Although frankly, with fish it’s hard to tell. Anyway, no corn syrup and no koi or carp. Please refer other complaints to the Bureau of Odd Happenstance, and remember to include a self-addressed, stamped badger with your inquiry. Series descriptionWelcome to Rannit, an ancient city awash in magic and mayhem. Wracked by war, but embracing the dubious wonders of steam and iron, Rannit is on the path to renewal – but old magics and older shadows won’t go easily into the light. Markhat earns his living as a finder. On behalf of his clients, Markhat will find anyone, or anything, for a fee. In Three Mean Streets, his clients include a dead man’s ghost, a mighty Troll warrior seeking his cousin’s mounted head, and the true identity of the corpse allegedly stalking the grounds of a rich widow’s mansion. Markhat doesn’t believe in ghosts and walking corpses, but for twenty crowns a day, plus expenses, he’ll wade in swinging. With the aid of soothsayer and card-reader Mama Hog, Markhat sets out on three perilous cases, and they share only one thing in common – nothing in Rannit is quite what it seems, and sometimes good and dead isn’t good enough. 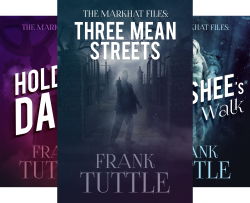 The three Markhat adventures in Three Mean Streets were originally published under the title The Markhat Files. The stories included are The Mister Trophy, Dead Man’s Rain, and The Cadaver Client. If you have previously purchased The Markhat Files or any of the titles stated, you already own these, so you don’t need to purchase them again.